Hawaii’s Big Island Is Growing…Hair?! Roads split by lava, shuttered businesses, and home evacuations–the effects of the ongoing eruptions from the Kilauea volcano have been devastating to Hawaii’s 4,000-square-mile Big Island since they first began in early May. One effect, however, is more surprising than dangerous, and is giving the island’s forested landscapes an unusual makeover. Over the past few weeks, parts of the Big Island, particularly in the Puna District, seem to have grown hair, as golden fibers as long as two feet have sprouted from the earth. 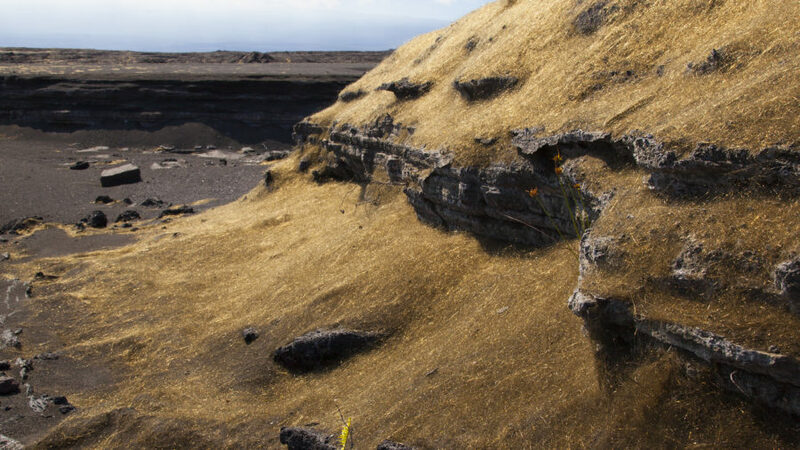 The new ‘do, known as “Pele’s hair,” is a natural phenomenon that occurs when gas bubbles formed in lava burst and stretch into long strands, which glisten when they catch the sunlight. “Pele’s hair is literally a very fine glass fiber,” explains Leslie Gordon, a geologist with the U.S. Geological Survey. The fibers earned their nickname from the goddess of fire, a powerful and majestic deity from Hawaiian mythology. Since Pele’s hair doesn’t pose a major threat to the community, there currently aren’t plans to remove it. “Geologically, Pele’s hair is ephemeral, and quickly decomposes into any soil,” explains Gordon. Nonetheless, locals should still avoid getting too close. Given their fragility, the fibers can be easily picked up by wind and rain and in turn, can find their way into water that is collected for drinking or onto grasses where livestock feed. Locals should also be wary of particles carried by the wind, as it can be irritating if slivers make it into your eyes or onto your skin or clothes. “It’s never fatal, but it can be a serious nuisance,” she warns.